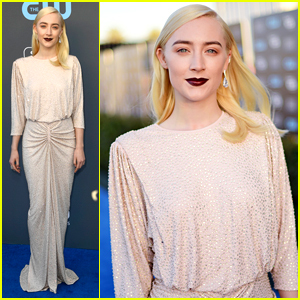 2018 critics choice awards Photos, News, and Videos | Just Jared Jr.
Saoirse Ronan‘s date to the Golden Globes earlier this month was originally going to be her mom, Monica – but it didn’t go as planned. You see, the Lady Bird actress’s mom had to stay home — to take care of Fran, the family dog. “She’s not here right now because she’s at home looking after Fran,” Saoirse explained to Jimmy Kimmel on The Tonight Show earlier this week. But don’t worry, Monica was on FaceTime witnessing her daughter win, and then crying over the phone app. If you remember, Monica was actually Saoirse‘s date to the 2016 Oscars, where she was also nominated for Brooklyn. Skyler Samuels Joins Patrick Schwarzenegger at Critics' Choice Awards 2018! Skyler Samuels is all smiles as she hits the blue carpet at the 2018 Critics’ Choice Awards on Thursday (January 11) at The Barker Hangar in Santa Monica, Calif. 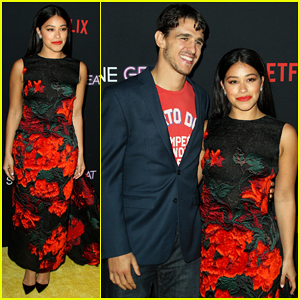 The 23-year-old actress looked pretty in a red, lace dress as she was joined at the event by Patrick Schwarzenegger. Joining Skyler and Patrick at the awards show was Three Billboards Outside Ebbing, Missouri actress Samara Weaving. FYI: Skyler is wearing a Giamba dress and Schutz shoes. Patrick is wearing Tom Ford. Samara is wearing a Roland Mouret jumpsuit. Kiernan Shipka and Yara Shahidi rocked fun colors and prints at the 2018 Critics’ Choice Awards! 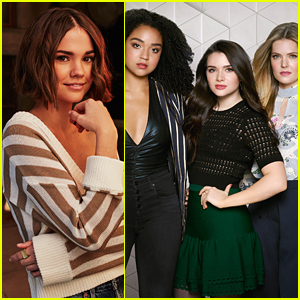 The new Chilling Adventures of Sabrina star and the Black-ish actress stepped out for the event held at The Barker Hangar on Thursday (January 11) in Santa Monica, Calif.
Kiernan rocked a green and pink tulle embroidered top with white and blue jacquard skinny trousers, and Yara stunned in a purple printed gown with a ruffled collar and gold details. They were joined by Sarah Hyand, who looked glam in a sleeveless black and white gown with a beaded top and layered tulle skirt, completing her look with red lipstick. The trio all styled their hair into updos. Also in attendance were Kiernan‘s Feud co-star Jackie Hoffman, as well as Yara‘s Black-ish co-star Marcus Scribner. Modern Family and Black-ish are both nominated for Best Comedy Series, and Feud is up for Best Limited Series. FYI: Sarah is wearing Naeem Khan with Giuseppe Zanotti shoes and Lorraine Schwartz jewelry. Kiernan is wearing Delpozo with Miu Miu shoes. Yara is wearing a Giambattista Valli dress, Jimmy Choo sandals, and Jemma Wynne earrings. 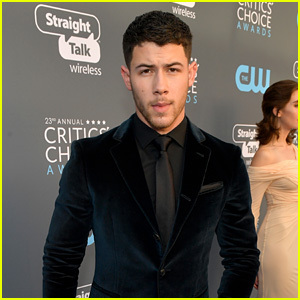 Nick Jonas Looks Handsome on the Carpet at Critics' Choice Awards 2018! Seriously, how good does Nick Jonas look? The 25-year-old “Levels” pop superstar and actor looked sharp as always at the 2018 Critics’ Choice Awards held at The Barker Hangar on Thursday (January 11) in Santa Monica, Calif.
A few days prior, Nick had fun attending the 2018 Golden Globes – and cozied up to Mariah Carey afterward! “Golden globes moments with the incredible @mariahcarey,” he captioned the cute pic. Tune in for the Critics’ Choice Awards, hosted by Olivia Munn, at 8/7c on The CW. 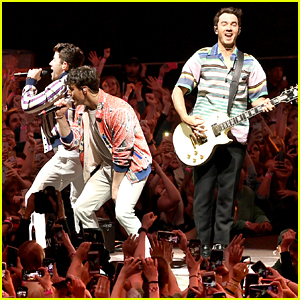 FYI: Nick is wearing a John Varvatos outfit and Tom Ford shoes. Brooklynn Prince Wins a Critics' Choice Award at Age Seven! 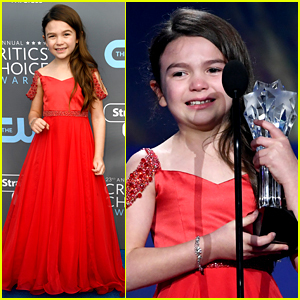 It’s already a big night for young star Brooklynn Prince, who took home the award for Best Young Actor/Actress at the 2018 Critics’ Choice Awards on Thursday (January 11) at The Barker Hangar in Santa Monica, Calif. The seven-year-old actress won the award for her work in The Florida Project. 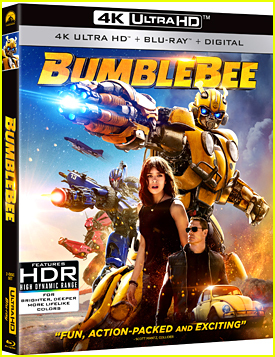 Also nominated were Gifted‘s Mckenna Grace, Logan‘s Dafne Keen (not pictured), Wonderstuck‘s Millicent Simmonds, and Wonder‘s Jacob Tremblay. FYI: Mckenna is wearing a Dolce&Gabbana dress. Emma Roberts hits the blue carpet alongside longtime love Evan Peters at the 2018 Critics’ Choice Awards held at The Barker Hangar on Thursday (January 11) in Santa Monica, Calif.
During the awards show, the 26-year-old actress showed off super bold new blunt bangs. Emma went pretty in a silk white dress for the awards show while Evan kept things classic in a black tux. Evan is nominated tonight for Best Actor in a Movie Made for TV or Limited Series for his role in American Horror Story: Cult. FYI: Emma is wearing Norman Silverman jewelry.